Conveniently located at the intersection of Val Vista Drive and Southern Avenue in Mesa, Arizona; less than a quarter mile north of the 60 Freeway, and just 15 minutes from Phoenix Sky Harbor Airport, is the Corporate Center Conference Suites. 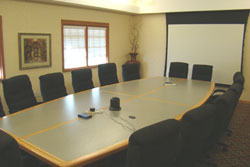 This TO&A court reporting facility offers four large conference rooms with multi-presentation capabilities and smaller conference rooms if you desire. We offer our law firm clients a complete array of professional services including state-of-the-art telecommunications, broadband internet service, business support services, training room, fitness center as well as many other amenities. Altogether, an impressive meeting place for you and your clients. Our highly trained litigation support team ensures you have the best professional infrastructure to perform discovery. Ample parking is provided, as well as 24-7 office access, with complete security system safety. On-site eating establishments and beautifully landscaped fountain and outdoor seating areas are all available for your comfort and convenience.